Wrong assumptions kill more startups than bad products. (For the purpose of this article I am using the word customer very broadly – for this article by customers I mean all entities that will either use, or pay for or influence the purchase of your product or service). Inaccurate assumptions about who will buy, how much will they buy, how often, how much will they pay, etc. can put a business on a completely different path than estimated by entrepreneurs in their business plan. While most entrepreneurs spend quality time in designing the product or service, they do not spend adequate time in understanding WHO EXACTLY their customer is. Entrepreneurs often ‘guess’ who their customers would be, and what their behaviour towards the product/service would be. And because this guess is often based on the entrepreneur’s own enthusiasm about their, it can be significantly different than the reality. Often, inaccurate assessment of the customer segment and the reasons for their buying the product/service are fatal mistakes for startups. Start talking to customers (potential users, influencers, and buyers) BEFORE you start fine-tuning your concept. Most certainly talk to customers before you develop your MVP. The most common mistake that many startups make is to embark on a deeper customer discovery process AFTER they think through the concept. Often startups start with broad assumptions on what problems their potential customers are looking solutions for, and start designing and refining the concept. Then they go ahead and develop a MVP, or sometimes even the full product, and then check if customers feel as excited about their concept as they do. Well, if the assumption of the real problem is correct, the solution is a success. The problem is that your assessment of what the problem is could be slightly or significantly different than the way the customer sees the problem. And that is a fatal mistake for many startups. It can sometimes kill the company, and in most cases at least delay getting to the right problem-solution fit and then the product-market fit. (Even when you talk to customer after designing and refining a concept, many entrepreneurs find it difficult to let go of the concept if the customer interactions do not support the entrepreneur’s enthusiasm about the concept. They try to tweak the concept a bit here and there – tweak the price-points or features or value-proposition – as it is emotionally very, very difficult to discard a concept after you have spent days designing and refining it, and eventually falling in love with it. They therefore some try to ‘modify’ the concept in a manner that they THINK will work based on that the customers have told them. It may. Or it may not. But if the entrepreneurs had not invested so much emotional energy into designing and refining the concept, they may have found it easier to embrace the customer’s problem rather than falling in love with your proposed solution to an imaginary problem. What entrepreneurs should therefore do is ask customer what they need BEFORE YOU START DEVELOPING YOUR CONCEPT. Customer discovery is important because it allows you to design your entire business well, including your product and value-proposition. 1) Customer discovery helps your define the problem that your startup solves: Understanding who the customer is will help you define very, very clearly what problem you are solving for them. E.g. a tier II city person’s primary reason for buying garments online is that they may not have access to as much choice as folks in metro cities may have, while the primary reason for buying online for a person in metro cities could be convenience. Similarly, if you are selling hospital management software, the need of a single hospital brand will be different than the needs of a small chain of hospitals and likewise a national or an international chain of healthcare company is likely to have quite different needs and challenges. Since they are all looking for solutions to different problems, or at least their prioritization of which problems are more important are likely to be different, grouping them as ‘Mid & large sized hospitals’ may not be very useful in understanding what specific problems hurt your customers the most. 2) Customer discovery helps you design the solution: If you have a clearer understanding of the problem you have to solve for your customers, you will be able to design your concept far more clearly. E.g. In the case of a mobile app for music, if your customer’s need is to ‘get more music free’ your concept is likely to be quite different than if their need is to ‘discover independent artistes that they are unlikely to find on i-tunes and other regular music stores’. Selecting which need to service will help you design not just the product but who the stakeholders and vendors and partners would be. It will also help you define where you are likely to find these partners… and doing business will record labels who have access to 1000s of popular artistes will be quite different than doing business with 1000s of independent artistes. Which means you are likely to need a very different set of people and resources to deal with these two different segments. Which means that your cost structures are likely to be different, and so are you efforts and therefore your timelines for launch, growth of music on your platform, etc. are likely to be quite different. As you can see, in this case while the core music app may remain the same, the business around that app will have to be thought of very differently depending on which problem you choose to solve. (And of course, if you choose to address both the problems, your business design will be totally different too… and that is also the reason why it is prudent, and often practical, to choose to address ONE problem for ONE customer to begin with rather than trying to do multiple things for multiple people. Its hard to get one thing done well… imagine doing multiple things at the same time.). Likewise, if your concept is to provide online learning solutions for companies, even within the same customer group (e.g. companies in the 100 – 500 people size range) different companies may have different needs. Some may want access to external content with guarantees of quality and availability, while some may just want a platform to deliver their proprietary content delivered by their team members. In both cases, while the technology solution will remain the same, the overall solution around it, and the underlying resources infrastructure, processes, partners, people needs, etc. will be very, very different. In one case, the company’s business will be ‘to provide technology platforms for delivering learning content’ while in the other case the company’s business will be to ‘connect learners in the company to high-quality subject matter experts’. As you can see, in this case, even with the same product, the business of the company has changed completely just because they were able to clearly define the different needs of different customer segments. 3) Customer discovery helps you design the product: How your product will be designed and what features are important, and which are not, are dependent entirely on who your customer is and what their needs are i.e. what your product does is dependent on what problem you are solving for he customer. E.g. in the example of the mobile app for music, the functionality of music discovery will be significantly different if they decide to solve the ‘let me find new independent artistes that are not available with record labels’ problem than solving the ‘let me get more music free’. In case they decide to solve the ‘help me find new music’ problem, then the search functionality will most likely be different with user ranking and votes and ‘people like you also like’ type of features, which may not be necessary if the startup decides to address the ‘Help me get popular music free’ problem. 4) Customer discovery will define your business case: Defining who your customer is, and how critical that problem is for them will dictate how much you could charge them, and how often they will buy/use your product. E.g. a single hospital may not be able to pay you much for your hospital management solution as a large hospital chain would, but the overall billing with the single-hospital will be much lower than a hospital chain. However, the decision making in larger hospital chains is likely to be much longer than the decision making in the single-hospital chain. Also, model of engagement could be different. A single-hospital may be willing to buy on the basis of an online demo, while a large hospital chain may want you to make presentations to various committees, do a pilot and then buy the solution. Both these option will have different cost structures and revenue potential, and therefore a will have very different business cases. As a result, your cash flow needs and fund flow needs will be significantly different depending on which segment you choose to target initially. In the above example, can you target both? Of course you theoretically can. But selling to single-hospital brand will need different sales teams with very different competencies, and experience, than the sales team that can deal with senior management of a large hospital chain. So while it is possible that your solution address the same problem for both customer segments, it may not be possible to leverage the same sales team and customer support teams to service both these customer segments. Of course, in the case of physical goods and stores, the look & feel, quality of materials used, location, etc. will be different depending on the which segments you service. And therefore your underlying cost structures will be different too. 5) Customer discovery helps you define how you plan your operations: As seen in the case of the hospital management software, how you sell, where you sell, who sells, how the pre, during and post customer experience is, how your CRM is designed, processes, packaging, logistics, collaterals, media & PR plan… all this will be dependent on which customer you choose to service. E.g. if you are selling educational solutions (say a math revision software), you would sell it to schools or you could sell it to parents or you could sell it to parents via the schools. In all the three cases, while the product remains the same, your business case , pricing strategy, distribution strategy, packaging, customer support team, sales team, marketing campaign & budget, etc. will all be very, very different depending on which customer segment you choose to target. Customer discovery is about getting a deeper understanding more about why your customer will buy. And also why they may not buy. How often do we hear entrepreneurs describe their customers as ‘Women aged 25 – 35’ or ‘Small & Medium Companies’ or ‘Teenagers in tier 1 cities’ or ‘Housewives in tier II and tier III cities’.While these broad segments can be a good starting point, entrepreneurs need to dig far deeper into the segments to understand their customers. Apart from demographic segmentation, it is important to understand the behavioral triggers that will determine whether the customer shares your enthusiasm for your product or service. How you go about digging deeper? One good way is to brainstorm, debate and deliberate on this within the team, and ideally with folks who have some understanding and experience of selling to customers in that broad segment. A good starting point is to first list out all possible segments and then break them into smaller segments based on demographics e.g. if your broad target group is young adults, would there be a difference between young adults from financially well to do families than those from financially challenged families? Both may need a different solution to two different problems, or they may have the same problem but how you service their problems could be different. E.g. in the financial services industry, a ‘bottom-of-the-pyramid’ customer (e.g. the need of a construction worker staying in a makeshift and temporary accommodation at the construction site will be ‘a place to keep/store my money safely and easy access when I need it’. With the same bank, a professional working in a MNC may be looking to switch from his bank because he is looking for ‘a bank that provides a great online interface and a great mobile app’. Same product… different needs because the customer segments are different. Even within the same segment, needs could be different. E.g. for a mobile banking app, a professional who trades regularly in the stock market may want a different set of features than a professional who does not trade in the stock market. Understanding needs of different people can help you design (a) either a different solution for different need groups or (b) design your product to allow a ‘customize your app as per your needs’ feature or (c) have a bunch of features that are relevant for different needs groups but have a communication campaign which highlights the critical needs of different types of users. Why is it important to understand why customers may not buy? Let me illustrate with an example. One social impact had innovated on a business model that allowed them to provide branded & packaged food grains, pulses and sugar at much lower prices to financially weaker sections of the society. They would go to slums with their vans and from the vans sell the goods, thus reducing the costs associated with a fixed shop. While concept tests with customers proved conclusively that if the goods were available at lower prices, they would definitely prefer it over un-packaged food grains, pulses and sugar from the local corner grocery store. However, when they implemented the solution the sales were much, much lower than what their research had indicated. On digging deeper they realized that while the reason for why they would buy was clear, the company had not checked the reasons why people would not buy the product. On further investigation they figured out that poor people often bought on credit, which the local grocery store provided and these folks supplying on vans were not able to. Moreover, apart from credit, the local grocery store would also extend some small loans during emergencies, and because of this dependency the slum folks were unable to buy better product even though they were lower priced. During their research the company had not asked the customer what would prevent them from buying these products. If they had, they would have had to do a different business model, and perhaps a different communication campaign. Often startups with better products than leading brands are not able to make a sale. They wonder why they have not been able to sell as many products as their initial research indicated they could. The problem may not be with the product but with the fact that customers may not be comfortable buying from a startup that they are not sure about. Especially in the case of enterprise customers, the challenge for startups is to get customers to even try the product to prove that it is better than the competition. Enterprise customers are reluctant to buy because they seek dependable after sales support, training, etc. which larger, established brands are able to assure better than startups. How do I discover who my customer should be? There is no one right way to discover who your customer could be. Also, it is not necessary that there is ONE right customer segment. You could have an option between multiple segments that make a good business case to pursue. And that’s a good thing. Strategy is about then choosing ONE option from among the various options available to you and then aligning all your resources in line with that chosen strategy. 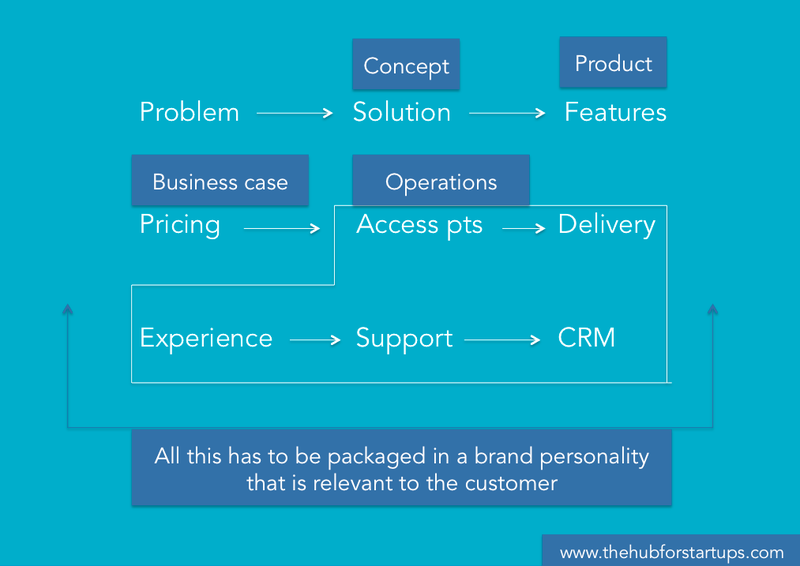 To check who your customer could be, try to understand what problems are important for which customer segment. The more critical the problem, the better your chances of your solution being bought. Of course you have to check other factors like competition addressing that segment, the size of that segment and does it make for a good, profitable business case. DO NOT ASK QUESTIONS LIKE ‘IF THERE WAS A SOLUTION LIKE <CONCEPT>, WOULD YOU BUY?. This is the WRONG way of testing whether the concept works as you are likely to get a false yes or no as the customer is unlikely to know whether the solution will address his or her problem. Instead, try probing if the customer has the problem you assume they had, and if they do, what is the severity of the problem and what they are currently doing to solve that problem. E.g. if your product is a hospital management solution, it is of no use asking hospital administrators “If you had a hospital management software, would you use it”? They may say yes, or they may not… after all in that 30 seconds after asking that question how much rationality can they bring into the answer. However, if you were to ask them “So, can you tell me the 2-3 most challenging things about managing a hospital?” the administrators are likely to spell out all the issues they have in doing their work. If the problem you are trying to solve does not get mentioned in the list of top 2-3 problems for your customer, you can assume that it will be a difficult sale and that the customer is not likely to be as excited about your solution as you had hoped they would. If on the other hand if the customer does mention the problem you are trying to solve as an important one, then you should check what they are doing currently to solve that problem. If they are doing something, no matter how rudimentary (e.g. using excel sheets to manage the functions and shifts in a hospital), it means that not only is the problem important, it is severe enough for customers to find a solution for it. In summary: Identifying who your customer is BEFORE you design your concept, and certainly before you develop your product or service, is critical. It can be the difference between failure and success of a startup. It is important for entrepreneurs to clearly know who will buy your product, why they will buy it, how much they will buy, how often will they will buy, how much will they pay for it, … and why they may not buy even if it addresses their problem. Not knowing this is like cooking a meal without knowing who is coming for dinner.